The Winnipeg Jets finish a three-game homestand tonight against the San Jose Sharks…The Jets beat the Anaheim Ducks 9-3 on Saturday night and have won both games of the homestand so far…After tonight, the Jets embark on a three-game road trip through the Atlantic Division, beginning Thursday against the Montreal Canadiens. Winnipeg has won seven consecutive games and 11 of their last 13 contests at Bell MTS Place to improve to 20-6-2 at home this season…The Jets’ seven-game home winning streak is their longest of the season…It’s tied with San Jose for the longest active home winning streak in the league and two games shy of Tampa Bay’s season-high nine game home winning streak…The Jets the have most points and are tied for the most wins at home in the NHL…The Jets have the best power play at home in the NHL this season at 36.9%, including four-for-eight during the homestand…Winnipeg’s 31 power play goals at home this season is first in the NHL…The Jets are 18-for-43 (41.9%) on the power play in their past 13 home games…The Jets have a 52-13-4 record at Bell MTS Place during the past two seasons, making it the toughest building in the NHL for opposing teams to play…The Jets have scored 112 goals at home this season, which is tied for first in the NHL, and have outscored their opposition 108-49 in their 20 wins…Winnipeg has scored at least four goals in all seven games of their home winning streak. The Jets have scored a power play goal in four consecutive games, going 6-for-13 (46.2%)…It’s their fourth streak this season of four games or more with a power play goal…Winnipeg is second in the NHL with a 27.6% power play percentage. The Jets are in a stretch of 11 games (3-1-0) in 20 days…Winnipeg went 6-3-0 in nine games in 16 days leading into the break…The Jets are playing their last 34 games of the regular season in 69 days. 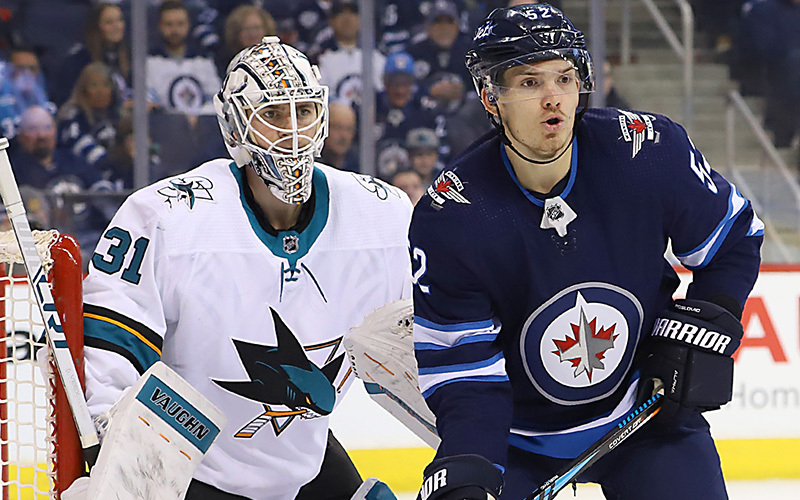 The Jets are 11-3-1 against Pacific Division opponents this season and have won six of the past seven games…Winnipeg was a dominant 17-4-2 against Pacific Division foes last season and are on an 21-4-3 run in their last 28 games versus the Pacific…Mark Scheifele (6G, 9A and Blake Wheeler (4G, 11A) lead the Jets in scoring against the Pacific Division this season with 15 points in 15 games…Dustin Byfuglien has 11 points (2G, 9A) in 10 games against the Pacific Division this season. Winnipeg has scored four goals or more in 10 consecutive victories and in 16 of their past 17 wins…The Jets are averaging 4.6 goals per game in wins this season, which is the second most in the NHL…Meanwhile, the Jets have been limited to two goals or less in eight consecutive losses and have been outscored 26-8 in those games…Of the 52 games the Jets have played this season, 32 have been decided by two goals or more. The Jets are second in the NHL with 71 goals in the third period this season…Winnipeg’s plus-21 goal differential in the third period is tied for second in the league…The Jets have scored in the third period in 11 of their past 12 games (20G), including two goals in five of the past seven games…Patrik Laine and Kyle Connor lead the Jets with 10 goals in the third period this season. Jets head coach Paul Maurice is slated to coach his 1,500th game as an NHL head coach tonight… Maurice will be the sixth head coach in NHL history to reach 1,500 games coached, joining active NHL coaches Barry Trotz (New York Islanders) and Ken Hitchcock (Edmonton Oilers)…Maurice is ninth in NHL history with 682 wins and needs three wins to pass Pat Quinn for eighth place…He is the winningest coach in franchise history with a record of 222-148-45 during the past six seasons…Maurice became the head coach of the Hartford Whalers in November of 1995 and coached his first NHL game on Nov. 7/95 against the San Jose Sharks, which Hartford won 7-3…One of the goaltenders in that game for San Jose is Jets goaltending coach Wade Flaherty. The NHL named Jets forward Jack Roslovic the league’s first star of the week on Monday…Roslovic opened the week with a goal in Winnipeg’s 3-1 setback to Philadelphia on Monday…On Thursday, the Columbus, Ohio native scored again in the Jets’ 4-3 come from behind win over his hometown Blue Jackets…On Saturday, Roslovic recorded his first career hat trick and four-point (3G, 1A) game in Winnipeg’s 9-3 victory over the Anaheim Ducks…Roslovic’s trio of goals were all on the power play, as he was the first Jets/Thrashers player to tally three PPGs in a game since Ilya Kovalachuk did it on Nov. 6/06…Roslovic scored the three goals in 2:20 of power play ice time, which is the third fewest PP TOI to score three or more power play goals since the NHL started to record time on ice…Roslovic led the NHL with five goals this week and was tied for the most points (6)…On the season, Roslovic has 16 points (7G, 9A) in 51 games and his 16.3% shooting percentage is third best on the Jets…This is the first time in his career that Roslovic has been selected in the NHL’s Three Stars of the Week…He is the sixth Jets player to be selected in 2018-19 after Winnipeg had eight appearances in the Three Stars of the Week last season…Roslovic joins Mark Scheifele (Dec. 17 – Second Star, Dec. 3 – First Star, and Oct. 29 – Second Star), Patrik Laine (Nov. 26 – First Star) and Blake Wheeler (Nov. 12 – Second Star) as members of the Jets that have earned NHL Three Stars of the Week honours this season. During Winnipeg’s three-game winning streak, 10 of the 16 goals have been scored by players aged 23 or younger…The Jets are second in the NHL with 85 goals scored this season by players age 23 or younger. Bryan Little has a point in 10 of past 12 games…He’s tallied 14 (7G, 7A) of his 34 points this season in the past 12 games…He posted 20 points in his first 40 games of the season…He’s also netted more than half of his 13 goals this season in his past nine games. Dating back to their 5-1 win against the Nashville Predators on Jan. 17, the Jets have scored 18 even strength goals and eight of the 18 goals have been scored by Winnipeg’s fourth line…Brendan Lemieux leads the trio with four goals, while Mason Appleton has two and Andrew Copp has one (Appleton set up defenseman Tyler Myers for the eighth goal). Needs seven games played to reach 100 as a member of the Jets. Needs four assists to reach 300 for his NHL career. Needs one point to reach 100 as a member of the Jets. Needs one point to reach 300 for his NHL career.